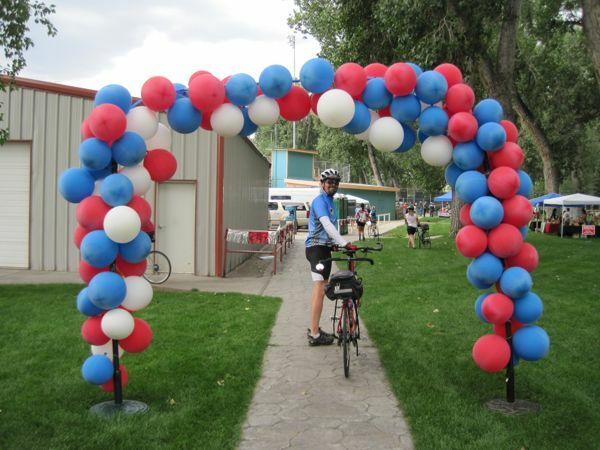 If you’re reading these blog posts closely, you may wonder how it is that we ended our Day 3 ride in Pinedale, yet started Day 4 in Farson, 60 miles away. No magic, just school buses. The entire camp was scheduled to vacate in two shifts – prior to 6 a.m., and around 8-ish – for the hourlong leapfrog over “relatively uninteresting” terrain to a park in Farson, where we would meet our bikes (they had been shipped out the night before). Not wanting to get started too late in the day, Bugman and I opted for the pre-6 a.m. bus shift, which meant we got up ridiculously early. It was interesting walking around our tent village in the pitch dark and seeing tents here and there illuminate as bikers woke up and switched on their headlamps. Most were white light, but some were red, and one was blue. We scurried to get everything packed up and to trick-or-treat our way through the sack breakfast line. Freshly made breakfast burritos – yummy!! I added some dried cranberries, an orange, and milk to my bag. Since we were running a bit late, I skipped the coffee. It was nice and warm on the bus, and some people snoozed in their seats. It was hard to see out my window because of condensation on the glass, but I did catch a glimpse of some pronghorn antelope off in the distance on a ridge. Our arrival in Farson was a bit chaotic. We were getting trained to look for those Zero Hero trash tents, but there were none to be found in which to deposit our breakfast trash. While Bugman waited in the portapotty line, I found our tandem in the mass of bikes parked in the bike corral and got the tires pumped up. I had an easy time, as a red tandem is not hard to spot, but some people wound up looking through the bike herd two or three times before they found their bikes. 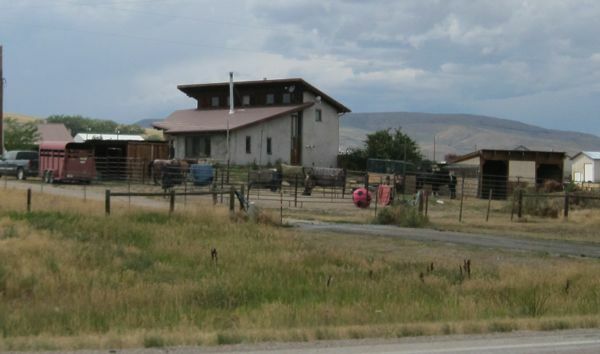 We planned to backtrack on the route a little to go to the Farson Mercantile for coffee, but when I looked for my wallet in my bike bag, it was nowhere to be found. Great! No money, possibly missing wallet, no caffeine, delayed start – plenty to make me grumpy that morning. Best to ride it off! First random photo of the day: a geodesic dome home. Had to take a picture, since Bugman has been interested in these since our days at Southern Illinois University at Carbondale, where R. Buckminster Fuller built the world’s first dome home in 1960. O, beautiful sight! Portapotties on the prairie! Uh-oh. Here it comes. We were warned at the briefing last night that we would be riding through a dozen or so miles of fresh chip seal. As someone commented that evening, “Now everyone knows what chip seal is.” “Yeah. Up close and personal. 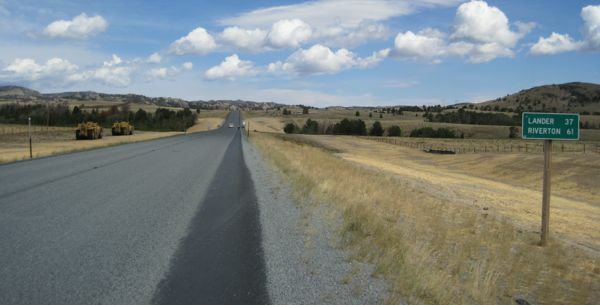 Miles and miles of it.” But first, some brand-new asphalt – some of the smoothest road on the entire ride. Some of our bikers mixed in with a tour bus group at a historical marker. Lotta interesting history around here. Aaaand – there’s the chip seal! It’s basically a layer of tar with a layer of small gravel on top. What it means for cyclists: there are scary areas of loose gravel, there are icky spots where tar flies up onto your bike and legs (I was still finding specks of tar on my legs a week later), there are sharp rocks that stick in your tires, and – by far worst of all – vehicles fling those small bits of gravel at you at high velocity as they pass. And this road had a lot of semi-truck traffic. And the speed limit was 65 mph. It. Was. Awful. Every time a truck went by, I would turn my face away from the road as the inevitable pelting commenced. Some of those flying rocks really hurt! (It’s enough to crack windshields, to give an idea of the force behind this stuff.) I was annoyed that the programmable electronic speed signs were not reset down from 65 to slow traffic a bit. 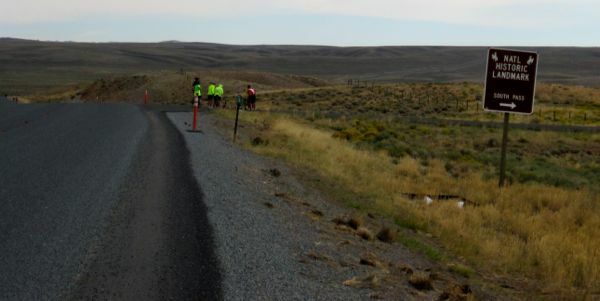 But the Wyoming DOT did help us out – they went out and swept the road shoulder the morning of our ride (we saw a pile of spent sweeper brushes on the side of the road). I am ever so grateful for that. Otherwise, the shoulder of the road would have been very gravelly and hazardous. “uth Pass” selfie. Oops. Didn’t frame that quite right when I set the camera down. 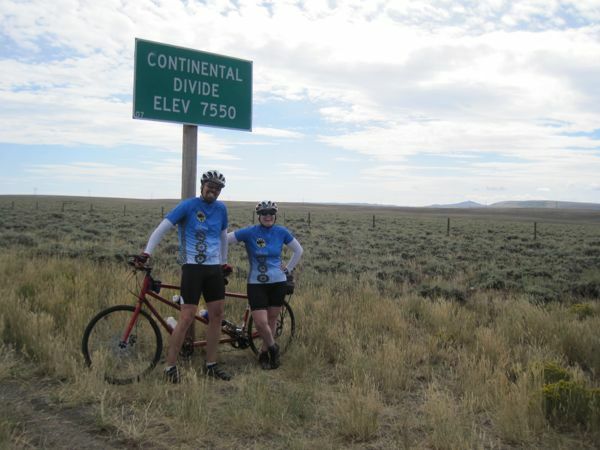 Continental Divide – the first crossing. 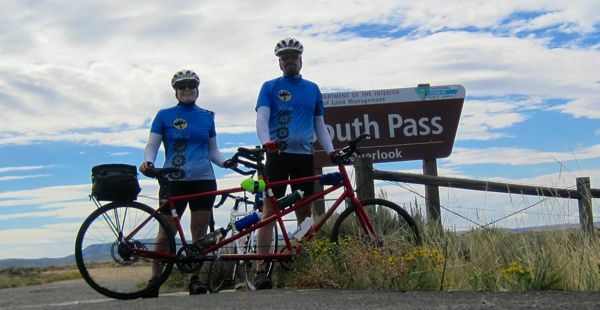 A fellow cyclist took our picture, saying “you’ve earned it!” A lot of cyclists gave us extra points for doing this ride on a tandem. Scene from a rest stop. By Day 4, we were all getting conditioned to the Zero Hero trash tents. To be as environmentally friendly as possible, we separated our trash on this ride, into recyclables, trash, and compost. 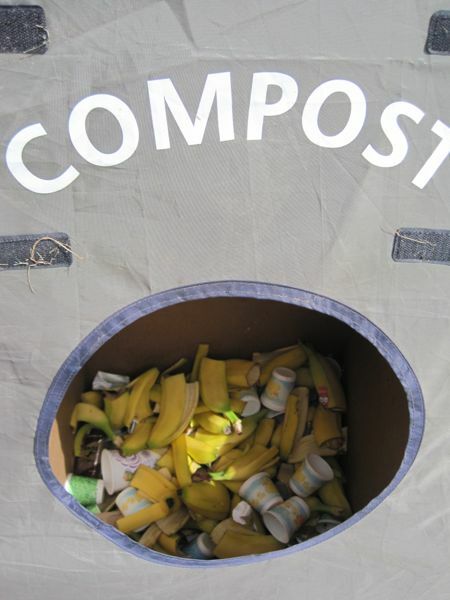 For some reason, the visual of yellow banana peels and the Dixie cups with yellow ducks in the compost bin a-peeled to me. (Ha!) The Dixie cups had contained shots of trail mix, if I remember correctly. Still riding fresh chip seal . . . 37 miles to Lander . . . Taking a break at the historical sign at South Pass City, where we stopped because we noticed a piece of rock had become embedded in our tire. When we pulled out the rock, we realized that our tire was starting to shred. Bummer!! At least we didn’t get a flat. And we were in luck – just one more mile to the lunch stop, where a bike mechanic could hook us up with a new tire. We rode a bit gingerly that last mile. 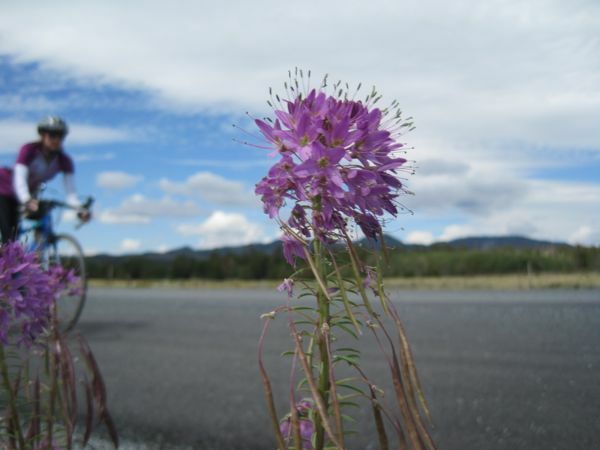 My attempt at being arty and photographing a roadside flower as cyclists rode by. Didn’t quite get the timing right. More construction! This construction zone was a bit dicey, as we were relying on the construction crew to get us through safely, and I don’t think they were all communicating with each other. The little group we were with had to dodge a street sweeper. Now is a good time to fix a tire! That sign warns of 4 miles of 7 percent grade. All told, my ride profile shows about 14 miles of significant, nearly uninterrupted downhill. Just before a rest stop (that had ice cream! So we had to stop), our GPS clocked us at 39.5 mph. Yowza! I’m really glad we noticed that embedded rock and got a new tire before attempting this descent! The bummer about the swift descent was the fact that it was through Red Canyon, which is absolutely beautiful. The scenery whizzed by all too fast, and there was no way I was going to release my death grip on the handlebars to take a photo. I’ll have to look up whether there are any hiking trails in those parts. Some of the rocks were really cool – they looked like artwork. Looking back from the rest stop. The rain chased us into Lander. It never more than sprinkled, though. Might have rained overnight, too. I can’t quite remember. What is this – horse enrichment in the form of a giant, pink soccer ball? It looks like an enlarged version of one of my cats’ toys. 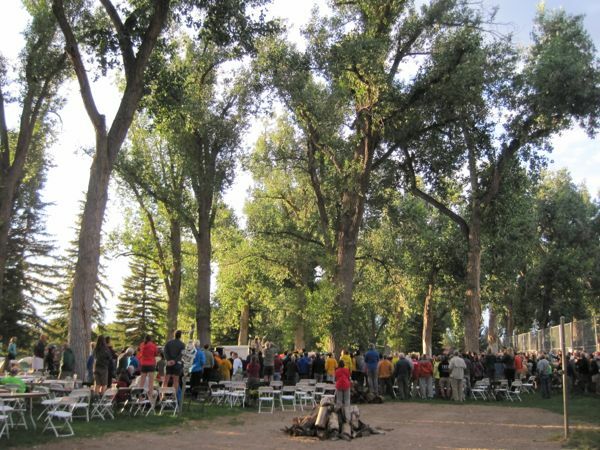 A crowd gathered under the trees for the evening entertainment – a performance by the Eagle Spirit Dancers, who demonstrated various types of powwow dance. I am always impressed by the athleticism of powwow dancers. It is not easy! 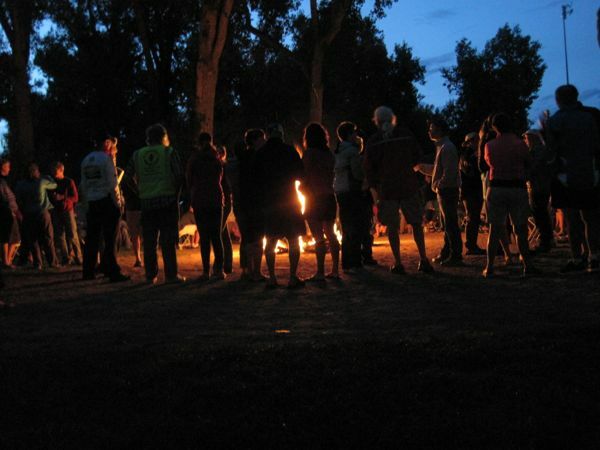 To cap off the evening, a convivial bonfire. PS – I did find my wallet. I had packed it into my suitcase instead of my bike bag in the early morning confusion.